Well-known for the wave of "Tamarin", Mauritius is another indian ocean surf paradise. 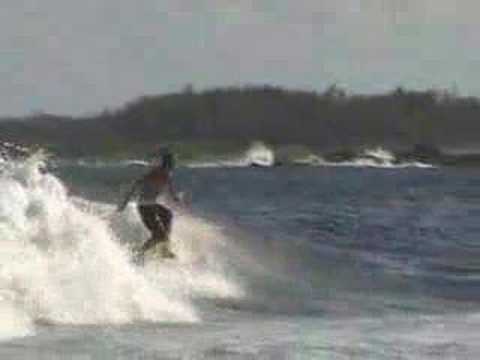 The main surf spots in Mauritius are concentrated on the south and south west side of the island. The swell size on Mauritius is generally about 1 m smaller than that on Reunion, this being attributed to the less steep coral reef drop-offs, and the fact that Reunion blocks off the swells moving in a north easterly direction from the Southern Oceans. The best months for surfing are between April and September. REPORT WHITE SHORT VIOLENCE 29/6/13 - SOME WORDS OF ADVICE FOR TOURIST SURFERS COMING IN MAURITIUS. IF YOU ARE HAVING ANY PROBLEMS WITH "WHITE SHORTS"
LOCK INTO YOUR PHONE CONTACTS THESE 2 VERY IMPORTANT PHONE NUMBERS. "BLACK RIVER COAST GAURD POLICE" 483 6922. BOTH THE TOURIST POLICE AND COAST GAURD POLICE WILL ACT ON ANY VIOLENCE SHOWN TOWARDS TOURIST SURFERS. THERE ARE 2 MAIN SUSPECTS IN THE WHITE SHORT GANG, A LITTLE SKINNY SCRAWNY GUY NAMED "BRUNO" & THE OTHER GUY NAMED "ETIENNE" TALL BLOND SHORT HAIR,HE IS A PILOT WITH 'AIR MAURITIUS" DONT BE AFRAID TO CONTACT THE "TOURIST POLICE" PHONE 213 2818. I went for a surf trip in indian ocean, spent 2 weeks in reunion island and then 1 week in mauritius island. Reunion was a good choice ! nice waves , very consitent , good vibes in the water. I've been told before going to mauritius that the called '' locals white shorts '' wasn't surfing anymore and that it was cool for foreigners to surf there, well it was wrong ! Mauritius has the worst localism i've ever seen during my surf travels !